Win NEVER-ENDING MAN: HAYAO MIYAZAKI Blu-ray/DVD Combo Pack! Shout! Factory is offering SciFi Japan readers a chance to win a Blu-ray/DVD Combo Pack of the documentary NEVER-ENDING MAN: HAYAO MIYAZAKI (終わらない人 宮崎駿, Owaranai Hito Miyazaki Hayao, 2016). The film offers a new look at Academy Award-winning film director and Studio Ghibli co-founder Hayao Miyazaki who, after an encounter with young CGI animators, Miyazaki embarks on a new project using these techniques to create a new short film, BORO THE CATERPILLAR (毛虫のボロ, Kemushi no Boro, 2018). But the artist, who has been adamant about hand-drawn animation, confronts many challenges that threaten to cancel the film. Can an old master who thinks he’s past his prime shine once again? Shot over two years, NEVER-ENDING MAN: HAYAO MIYAZAKI provides a unique, fascinating glimpse into the mind and creative process of one of animation’s most iconic storytellers. NEVER-ENDING MAN: HAYAO MIYAZAKI will be available on Blu-ray + DVD Combo Pack (SLP: $22.97) on April 30 from GKIDS and Shout! Factory. This release contains two different versions: a 70-minute version in Japanese with English subtitles, and an alternate cut; a 48-minute broadcast version with English narration which includes footage not included in the 70-minute version. Sentai Filmworks today announced that MADE IN ABYSS: WANDERING TWILIGHT (メイドインアビス 旅立ちの夜明け, Meidoin’ Abisu Hōrō Suru Tasogare, 2019) will premiere at Anime Central in Rosemont, IL, on Friday, May 17 at 8:30 p.m. Sentai Filmworks and Anime Central have teamed up to host a red-carpet event for this final film in the MADE IN ABYSS two-part compendium series. Picking up where MADE IN ABYSS: JOURNEY’S DAWN left off, WANDERING TWILIGHT continues the adventures of plucky cave raiders, Riko and Reg, as they confront the mysterious Abyss where sheer excitement and discovery are equally matched by looming danger and certain death. The film includes exclusive content and scenes available for the first time only on the big screen. Anime Central, the Midwest’s largest anime convention, boasts an attendance of over 30,000 anime lovers. Lucky fans will have a unique opportunity to attend the red-carpet premiere of MADE IN ABYSS: WANDERING TWILIGHT and take part in an exclusive Q&A session with Masayuki Kojima, the film’s renowned director, as well as Hiromitsu Iijina, the film’s music producer, and Kevin Penkin, composer of MADE IN ABYSS’ hauntingly beautiful musical score. 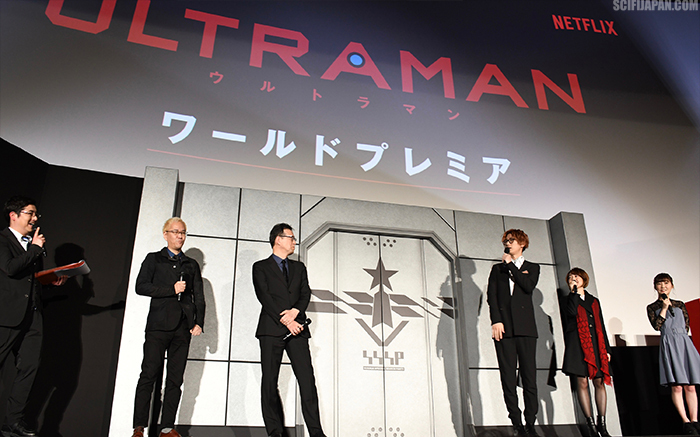 The directors and voice cast of the ULTRAMAN anime take the stage at the series premiere screening event in Tokyo. 24 hours in advance of the ULTRAMAN (ウルトラマン, Urutoraman) anime series beaming on Netflix to 200 expectant countries, a sold-out world premiere was held Sunday, March 31st at the Marunouchi Picccadilly 1 theater in in Yurakucho, Tokyo. Premium ticket holders saw the first two episodes, and were treated to special guest appearances by the directors and voice actors. Photo courtesy of Shout! Factory. © Toei Company, Ltd. © SCG Power Rangers LLC. The anime movie PENGUIN HIGHWAY (ペンギン・ハイウェイ, Pengin Haiuei, 2018) comes to U.S. and Canadian cinemas beginning April 12, courtesy of ELEVEN ARTS. Based on the novel of the same name by Tomihiko Morimi (The Night is Short, Walk on Girl), PENGUIN HIGHWAY is the first feature film from the up-and-coming animation house, Studio Colorido. The creative team includes director Hiroyasu Ishida, screenwriter Makoto Ueda (THE NIGHT IS SHORT, WALK ON GIRL), and character designer Yojiro Arai (THE WIND RISES, TYPHOON NORUDA), with music by Umitaro Abe. The theme song is by Hikaru Utada (KINGDOM HEARTS, EVANGELION: 3.0 YOU CAN (NOT) REDO). Win The GODZILLA: KING OF THE MONSTERS Godzilla Electronic Mask From JAKKS Pacific! Photo courtesy of JAKKS Pacific. © Warner Bros. Entertainment Inc. © 2019 Legendary, All Rights Reserved. TM & © TOHO CO.,LTD. SciFi Japan is pleased to present our second of several planned promotions for Warner Bros. Pictures’ and Legendary Entertainment’s GODZILLA: KING OF THE MONSTERS, hitting theaters May 31, 2019. JAKKS Pacific, Inc. is offering our readers a chance to win their Godzilla Electronic Mask! Tsuburaya Productions is hosting a world premiere screening of their new ULTRAMAN anime series this weekend. 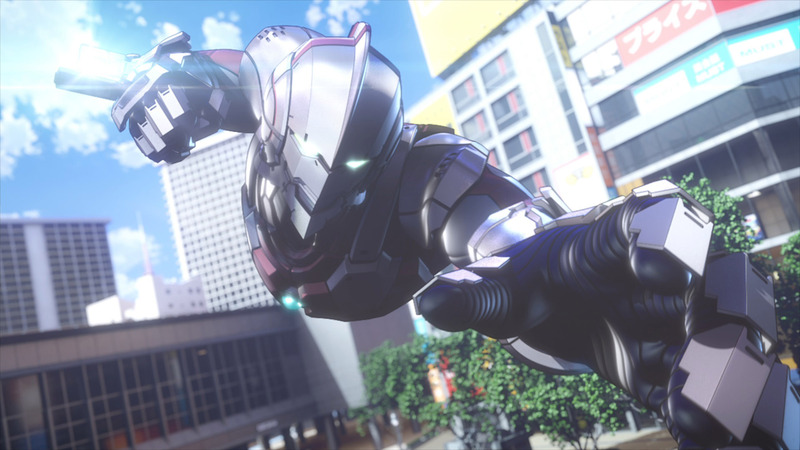 The new Tsuburaya Productions 3DCG anime series ULTRAMAN (ウルトラマン, Urutoraman) will exclusively stream worldwide on Netflix this coming Monday, April 1st. The show is based on the popular Ultraman manga by Eiichi Shimizu and Tomohiro Shimoguchi, and plays as a direct sequel to the original, live-action ULTRAMAN (ウルトラマン　空想特撮シリーズ, Urutoraman: Kuso Tokusatsu Shirizu, 1966-1967) television series. Win The GODZILLA: KING OF THE MONSTERS Giant Godzilla Figure From JAKKS Pacific! SciFi Japan is pleased to present our first of several planned promotions for Warner Bros. Pictures’ and Legendary Entertainment’s GODZILLA: KING OF THE MONSTERS, hitting theaters May 31, 2019. JAKKS Pacific, Inc. is offering our readers a chance to win their Giant Size Godzilla figure, which stands 24 inches tall and over 40 inches long! This March, Shout! Factory TV presents Super Sentai Madness! For three weekends, starting March 23, Shout! Factory TV will livestream an epic tournament of Super Sentai villains and their corresponding Sentai episodes on its service, on its Twitch channel and on its Pluto TV channel. Super Sentai Madness will culminate in a live finale on April 7, breaking down all of the villain match-ups and winner reveal, hosted by Shout! Factory’s Brian Ward and featuring MIGHTY MORPHIN POWER RANGERS’ Karan Ashley and POWER RANGERS: HYPERFORCE’s Andre Meadows. Images courtesy of VIZ Media. Aniplex of America is proud to present the U.S. premiere of the highly anticipated new series DEMON SLAYER: KIMETSU NO YAIBA (鬼滅の刃, Kimetsu no Yaiba, 2019) at the Aratani Theatre in the historic Little Tokyo neighborhood of Los Angeles. Attendees will be the first in the U.S. to experience this thrilling new series produced by ufotable (FATE/STAY NIGHT [HEAVEN’S FEEL] trilogy, FATE/ZERO) set to premiere in April. The premiere event will be held on Sunday March 31, 2019 at 3 PM (PDT) and will feature a theatrical feature-length animation along with a special giveaway for those who attend. Tickets are priced at $10 each and will be available starting Friday, March 8th at DemonSlayerPremiere. DEMON SLAYER: KIMETSU NO YAIBA is based on a popular manga by Koyoharu Gotoge and serialized in Weekly Shonen Jump magazine. This melancholy tale of humans and demons has captivated readers with over 3 million copies in print, quickly becoming a mainstay of the shonen manga genre. The story takes place during the tumultuous Taisho period (1912 to 1926) when two siblings must survive after their family is viciously slaughtered by demons. GKIDS, the acclaimed distributor of multiple Academy Award-nominated animated features, and Fathom Events are proud to continue their collaboration and deliver celebrated animated films to U.S. movie theaters throughout the year with STUDIO GHIBLI FEST 2019. Featuring nine of Studio Ghibli’s masterpieces, the series kicks off with the 15th anniversary of acclaimed director Hayao Miyazaki’s Academy Award- nominated fantasy adventure HOWL’S MOVING CASTLE (ハウルの動く城, Hauru no Ugoku Shiro, 2004). Sophie, a quiet girl working in a hat shop, finds her life thrown into turmoil when she is literally swept off her feet by a handsome but mysterious wizard named Howl. The vain and vengeful Witch of the Waste, jealous of their friendship, puts a curse on Sophie and turns her into a 90‑year‑old woman. On a quest to break the spell, Sophie climbs aboard Howl’s magnificent moving castle and into a new life of wonder and adventure. But, as the true power of Howl’s wizardry is revealed, Sophie finds herself fighting to protect them both from a dangerous war of sorcery that threatens their world. Featuring the voice talents of Lauren Bacall, Christian Bale, Billy Crystal, Blythe Danner, Emily Mortimer, and Jean Simmons. 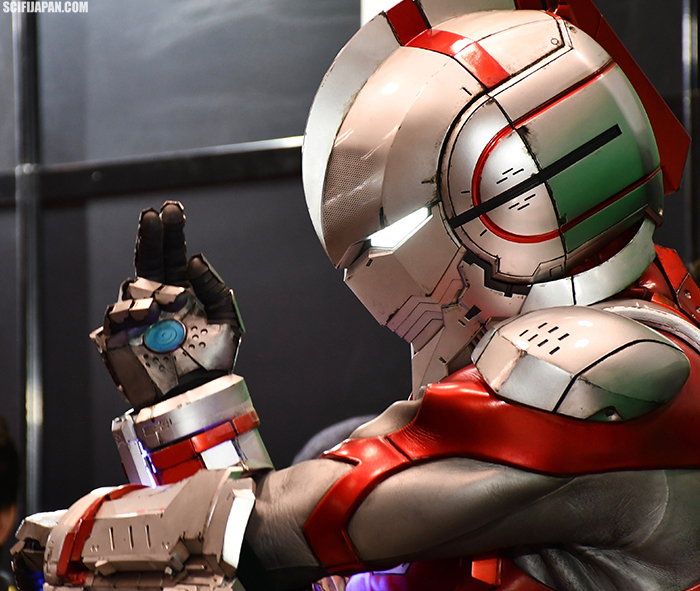 The ULTRAMAN anime stage event at Winter Wonder Festival featured a live-action suit based on the manga/anime Ultraman design. 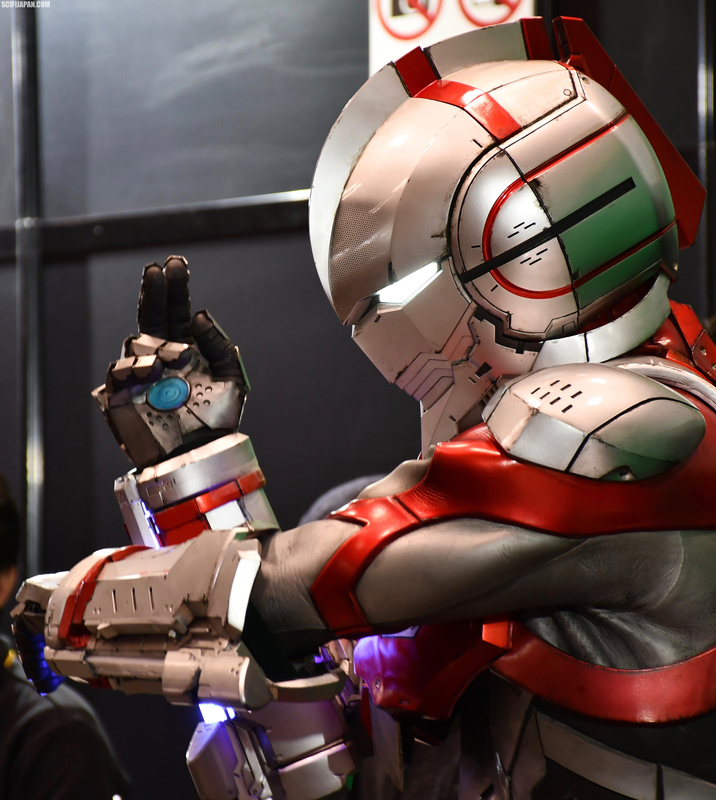 Wonderfest attendees and professionals alike gathered to celebrate all facets of goods emphasizing tokusatsu, anime, and home-grown characters. 150 exuberant fans of the hit ULTRAMAN manga series by Eiichi Shimizu and Tomohiro Shimoguchi pressed into the Kotobukiya special stage on Sunday, February 10th to learn more about the 13-episode ULTRAMAN series, which bridges the comic serialization of Eiji Tsuburaya’s timeless superheroes and kaiju featured in HERO’S magazine into a modern anime directed by Kenji Kamiyama (GHOST IN THE SHELL: S.A.C., 009 RE:CYBORG, BLADE RUNNER BLACK LOTUS) and Shinji Aramaki (APPLESEED, HARLOCK: SPACE PIRATE, STARSHIP TROOPERS: TRAITOR OF MARS). In just two weeks, Fathom Events and Aniplex of America will present the nationwide release of Fate/stay night [Heaven’s Feel] THE MOVIE II. lost butterfly (劇場版「Fate/stay night[Heaven’s Feel]」, Gekijō-ban Fate/stay night[Heaven’s Feel], 2019), as it hits cinemas on March 14 at 7:30 p.m. local time. Fate/stay night [Heaven’s Feel] THE MOVIE II. lost butterfly is the latest installment of the beloved series from the creators of the wildly popular Fate franchise that gave anime fans Fate/stay night [Unlimited Blade Works], Fate/Zero, Fate/Apocrypha, and the hit mobile game, Fate/Grand Order. This three-part movie follows the third route, known as the “Sakura Route,” of the Fate/stay night visual novel game, with the first chapter of the Heaven’s Feel trilogy, I. presage flower, released in 2017 to much fanfare. Funimation Films presents a special two-night premiere screening event for the highly anticipated, all-new series FRUITS BASKET (フルーツバスケット, Furūtsu Basuketto, 2019) in select U.S. cities on March 26 (English dub) & March 27 (English subtitles). Guests will enjoy the first two full episodes of FRUITS BASKET before the series’ scheduled television debut in Japan in April. Each ticketholder will receive an exclusive gift pack that includes a commemorative FRUITS BASKET 16 oz stadium cup, branded lanyard and set of three pinback badgers featuring the characters Yuki, Kyo and Tohru. Run-time, including special interview footage with Japanese and English voice actors, is 85 minutes. Advance tickets are available now at funimationfilms.com/movie/fruitsbasket. After kicking off in 2017 and returning for an even more successful 2018, STUDIO GHIBLI FEST is back for 2019. GKIDS, the acclaimed distributor of multiple Academy Award-nominated animated features, and Fathom Events are proud to continue their collaboration and deliver a new and expanded selection of celebrated animated films to U.S. cinemas throughout the year with STUDIO GHIBLI FEST 2019. Featuring nine of Studio Ghibli’s masterpieces, the series kicks off with the 15th anniversary of the Academy Award-nominated fantasy adventure HOWL’S MOVING CASTLE (ハウルの動く城, Hauru no Ugoku Shiro, 2004), and continues with the 35th anniversary of NAUSICAÄ OF THE VALLEY OF THE WIND (風の谷のナウシカ, Kaze no Tani no Naushika, 1984), WHISPER OF THE HEART (耳をすませば, Mimi o Sumaseba, 1995), the 30th anniversary of KIKI’S DELIVERY SERVICE (魔女の宅急便, Majo no Takkyuubin, 1989), MY NEIGHBOR TOTORO (となりのトトロ, Tonari no Totoro, 1988), THE SECRET WORLD OF ARRIETTY (借りぐらしのアリエッティ, Karigurashi no Arrietty, 2010), the Academy Award-winning SPIRITED AWAY (千と千尋の神隠し, Sen to Chihiro no Kamikakushi, 2001), PRINCESS MONONOKE (もののけ姫, Mononoke Hime, 1997), and concludes with the Academy Award-nominated THE TALE OF THE PRINCESS KAGUYA (かぐや姫の物語, Kaguyahime no Monogatari, 2013). Win MAZINGER Z: INFINITY on Blu-ray! SciFi Japan is pleased to offer our readers a chance to win the new Blu-ray edition of MAZINGER Z: INFINITY (マジンガーZ ／ INFINITY, Majingā Z/INFINITY, 2018). The movie is based on the classic manga series by Go Nagai. It follows our hero, Koji Kabuto, in an action-packed adventure where only he can choose his ultimate path! Ten years ago, the villainous scientist Dr. Hell led his wicked followers, known as the Underground Empire, in a struggle to destroy all of humanity. It was against these forces that the young hero Koji Kabuto fought, piloting the legendary super robot “Mazinger Z.” Koji’s victory stopped Dr. Hell’s evil plan and returned peace to the Earth. Now Koji has left the pilot seat behind and become a scientist in his own right, following in his father’s and grandfather’s footsteps. Yet an unexpected encounter deep under Mt. Fuji triggers an even greater threat to mankind than ever before and alters Koji’s destiny forever. With humanity’s fate in their hands, Koji and Mazinger Z face a choice between good… and evil.